- At first, when going to the ring, I did not want to compete. Now I only go to the ring to compete. It had been a bigger deal in my mind than what it actually was, commences Helmi Puustinen, 16 years old. 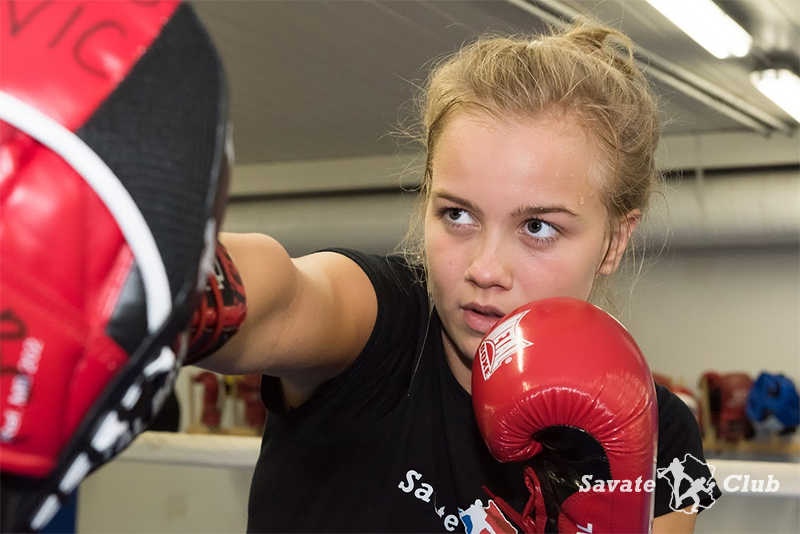 Three years ago Puustinen was told: ”You are in bad shape, go train at Savate Club”. Soon her earlier hobbies, dance and riding, started to give way to a fun sport that felt more like her own. 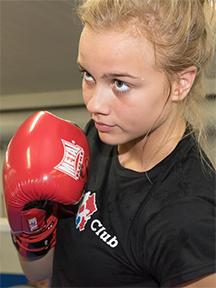 From Savate Puustinen moved to boxing over a year ago, a little by accident. - I was told I needed more strength to my arms, and was asked to join a boxing practice. I noticed right away that boxing is my sport. It gave me exactly the kind of contact I wanted. During the past year Puustinen has shown her talent. Of the five matches in her competition book she has won four. And her so far upward-bound career has not come from watching boxing movies. She graduated from Oulunkylä comprehensive school with excellent grades (average grade 9,54) last spring, and in addition to school, her day has often included two training sessions. As her strengths Puustinen lists endurance, speed, fighting intelligence, decisiveness and a will to practice. - I do what I am told to do, and even more, she says with a grin. - I want to improve my training also by thinking what strategies I can take to the ring, and how to execute them there. Endurance training has paid off. Puustinen has noticed she recovers faster. The risk of injuries and falling sick has decreased. Her goal for the coming years is to improve her technique. She will also work on adding power to her punches. She describes her relation to her jab as a love-hate relationship. - The jab is your best tool in the ring and must be trained constantly to make it effective enough. Regular practice has developed Puustinen both physically and mentally. - I am more confident, and social interaction has become easier. I have learned to make sacrifices and noticed that the one and only way to get results is hard work. I have also learned patience: earlier, when failing, I just threw my gloves to the corner. Now my problem-solving skills have improved, and the gloves stay tightly around my fists. Her friends have a positive attitude toward boxing, although she has caused some puzzlement by saying she is boxing seriously now. - Boxing has earned me respect among my circle of friends. It has increased my self-esteem, she honestly admits. The uncle of Puustinen is Matti Santala, who himself has a long and successful background in martial arts. Santala is one of the few fighters whose hand has been raised up in victory after fighting against a French champion in a Savate match. - I am forever grateful to my uncle who has helped me enormously. I also want to thank my coach Ray Medel and Jan Lagerbohm. I truly appreciate them being genuinely dedicated. In addition, I wish to thank the whole gang at Savate Club. Helmi Puustinen, with medical or law school in mind, will start in the fall at Mäkelänrinne high school, which emphasizes sports and offers great training opportunities. - Everything is set up for success, the rest is up to me, concludes Puustinen.